Have a need for industrial heater applications then send us your heating challenge! At JetHeat we've solved some of the most difficult temporary, industrial heating challenges. From ground and aggregate thawing on the North Shore of Alaska to bridge construction in sub-zero temperatures, our patented micro-turbine powered industrial heaters have overcome the hurdles, delivering safe, economical heat exactly where it's needed. We are able to address unique heating needs. Take for example, the owner of a Hot Air Balloon who needed to inflate it as quickly as possible. We were able to inflate a 77,000-cubic-foot hot-air balloon to a standing position in less than 10 minutes. How does someone easily paint one of the biggest suspension bridges in the world? With JetHeat! 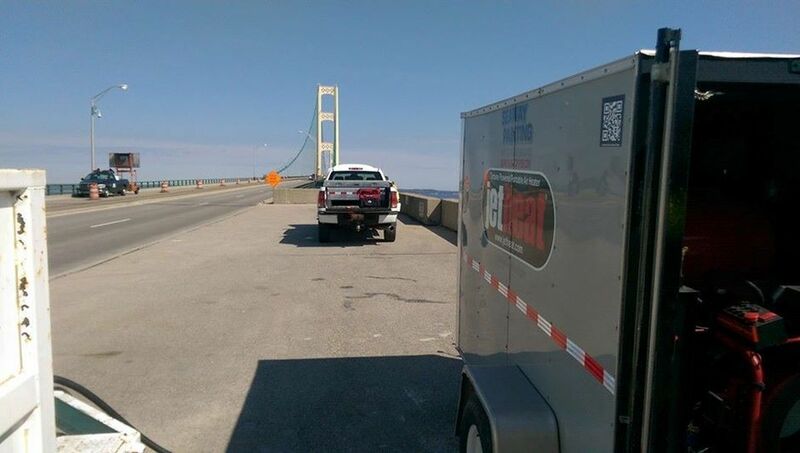 Painting the Mackinac Bridge with a GT 1400 as part of the work crew! Portable, compact, and easy to use even in the most unusual spots! Or perhaps you are looking to integrate JetHeat micro-turbine technology into your own unique application? Let’s explore how. If you need it dried, thawed or heated, JetHeat has a solution for your problem. Contact us to discuss your needs today! Send us your heating challenge and let our team of experts and technicians recommend the perfect solution to keep you job site or business running smoothly without downtime due to the cold weather. Call us at 1-877-JetHeat or fill out our contact form and give us your challenge!